If you can't send them to Paris, send Paris to your guests. 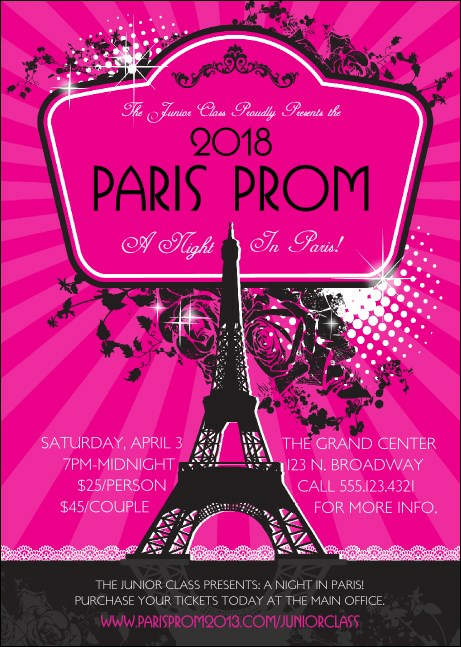 When you're ready to generate a buzz and remind attendees about your upcoming prom or Sweet Sixteen, the Paris Pink and Black Postcard is the perfect way to deliver your message. Featuring an image of the Eiffel Tower against a fashionable background, this postcard template has ample room for your event's details! Send yourself to TicketPrinting.com's online gallery to peruse a plethora of designs.